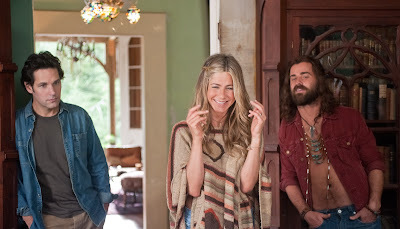 NickLannon.com: Wanderlust and the Fairy Tale of "No Rules"
Wanderlust and the Fairy Tale of "No Rules"
The 2012 Paul Rudd/Jennifer Aniston vehicle Wanderlust is a very underrated comedy. It includes perhaps the funniest scene of the year, but one that is miles too profane to link to here. Directed by David Wain (Role Models), Wanderlust is the story of a "normal" couple (Rudd and Aniston) who lose their jobs and home and find themselves spending time at a hippie commune in Georgia. As it turns out, then, there are rules. Of course there are. Hippie or preppy, we surround ourselves with rules. Without them, life doesn't make sense, chaos reigns...and even hippies avoid true chaos. (Tullian Tchividjian wrote about our need for rules recently in a wonderful post about Javert's suicide in Les Miserables) Of course, hippies and preppies have different rules (for instance, a different make of car might be acceptable or forbidden in each camp), but they are rule-bound nonetheless. Wanderlust's hippies show us our compulsion: they've been in rebellion for so long, the things they're rebelling against (for instance, walkmen and fax machines) are all hilariously out-of-date. We need to rebel, but the object of our rebellion is secondary. We set up rules to organize our rebellion, and find ourselves to be no different from those legalists we hate so much.